There's no shortage of Android GPS and navigation apps available on the Play Store, but not all maps are created equally. Many of them work offline as well as online, so you don't need to worry about having a data connection all the time either, provided you plan ahead a little. But other than that there is one thing that many of the navigation apps lack, and that is indoor navigation. This is to the sheer fact that GPS won’t work indoors, so when you find yourself in an enormous, busy shopping center, with no means of navigations, you tend to get little overwhelmed and lost. Don’t worry it happens to all of us. We stare aimlessly at the direction signs trying to figure out where our favorite stores or the washrooms are located and cursing and wining that Google Maps won’t work indoors. But there is a solution to this particular problem and its name is Mapsted Navigation. 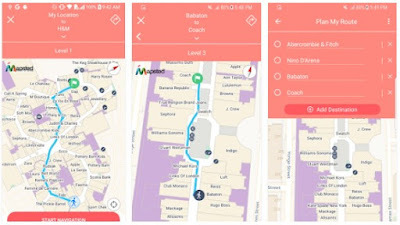 Mapsted Navigation is the world’s first indoor maps and navigation app that will help you find your way through the biggest and busiest shopping centers. It’s a great app that provides a feature that all other navigation apps lack. No more getting lost and spending valuable time searching for your favorite store at the mall. Or you need to buy a certain product, you just type it in the app and Mapsted Navigation will find the store and its location for you. The app lets you search stores, products and services by name, type and category and finds there location within the mall. This navigation app does not require usage of Wi-Fi or mobile data connection for it to work. All you need to do is download the map for a specific mall and you are set to go. It also does not abuse your phone’s battery power so you don’t need to worry about ending up with emptied up battery or even worse a turned off device in the middle of your shopping spree. Mapsted uses patented technology to provide the users with highly accurate and step-by-step indoor navigations. The maps have accurate and precise information about the locations of stores, wash and bathrooms, service kiosks and other amenities in a building. The Mapsted Navigation developers are currently working on updating the app with maps for other indoor spaces such as university and college campuses, airports, hospitals, convention centers, public office buildings and other indoor facilities. This makes Mapsted Navigation a true and rare gem in the ocean of navigation apps. You can find and download Mapsted Navigation at the Google Play Store.